NASA's Mars Reconnaissance Orbiter captured these images of the same regions of the Red Planet in May 2018 (left) and in July 2018 (right), after a global dust storm had taken hold of the planet. The huge dust storm raging on Mars is a curse for NASA's Opportunity rover but something of a blessing for the space agency's other Red Planet missions. The solar-powered Opportunity has been silent for weeks, unable to recharge its batteries because of all the light-blocking dust in the air. Mission team members think the six-wheeled rover, which has been exploring Mars since January 2004, has put itself into a sort of hibernation, and they're cautiously optimistic that Opportunity will wake up when the dust clears. 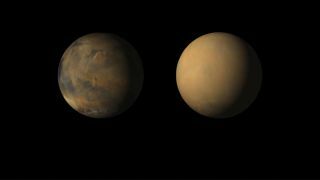 "Based on the longevity of a 2001 global storm, NASA scientists estimate it may be early September before the haze has cleared enough for Opportunity to power up and call home," NASA officials wrote in a statement Wednesday (July 18). But other agency missions are taking advantage of a rare opportunity — global dust storms engulf the Red Planet just once every six or eight Earth years — to learn more about the Martian atmosphere and climate. Curiosity's weather data could also shed light on how dust storms affect Martian "atmospheric tides," which are pressure waves that travel widely throughout the planet's air, mission team members said. "We're working double-duty right now," Curiosity project scientist Ashwin Vasavada, of NASA's Jet Propulsion Laboratory (JPL) in Pasadena, California, said in the same statement. "Our newly recommissioned drill is acquiring a fresh rock sample. But we are also using instruments to study how the dust storm evolves." Then there's the view from above. Three different NASA orbiters are intently eyeing the storm, which began on a localized scale in late May and had gone global by June 20. Researchers are using the THEMIS (Thermal Emission Imaging System) instrument aboard NASA's Mars Odyssey orbiter to monitor surface and atmospheric temperatures, as well as dust loads in the air. "This is one of the largest weather events that we've seen on Mars" since up-close spacecraft observations began in the 1960s, THEMIS team member Michael Smith, a scientist at NASA's Goddard Spaceflight Center in Greenbelt, Maryland, said in the same statement. "Having another example of a dust storm really helps us to understand what's going on." The THEMIS team has increased the pace of the instrument's global-atmosphere measurements from once every 10 days before the dust storm to twice per week now, Smith added. NASA's workhorse Mars Reconnaissance Orbiter (MRO), which first spotted the storm on May 30, is using two instruments to track its evolution and effect on atmospheric temperatures. This effect can be self-reinforcing, NASA officials said: As dust high in the atmosphere absorbs solar energy and heats up, wind patterns can change, lifting more dust off the planet's surface. These side-by-side animations, courtesy of the Mars Color Imager camera onboard NASA's Mars Reconnaissance Orbiter, show how dust has enveloped the Red Planet from May 2018 (left) to July 2018 (right). A better understanding of these details, provided by Odyssey and MRO data, could help researchers learn why some Martian dust storms peter out as localized affairs and others go global, NASA officials said. The agency's Mars Atmosphere and Volatile Evolution orbiter, or MAVEN, is focused on dust-storm effects higher up, where the Red Planet's air meets the vacuum of space. MAVEN's main mission goal involves better understanding how Mars lost its once-thick atmosphere, a pivotal event that caused the planet's climate to shift from relatively warm and wet to cold and dry. MAVEN's observations have already revealed that Mars' air was stripped by charged particles streaming from the sun, and that the damage began occurring around 4.2 billion years ago, when the Red Planet lost its global magnetic field. The current situation provides an opportunity to better understand what role, if any, big dust storms play in the atmosphere-stripping process, MAVEN team members said. For example, does the associated heating of the atmosphere cause more air molecules to escape into space? Ever since MAVEN arrived at Mars in September 2014, "one of the things we've been waiting for is a global dust storm," said MAVEN principal investigator Bruce Jakosky, of the University of Colorado's Laboratory for Atmospheric and Space Physics in Boulder.